Pirates! Get the ballot boxes out! Long before they made their way into the workings of modern government, the democratic tenets we hold so dear were used to great effect on pirate ships. Checks and balances. Social insurance. Freedom of expression. This, certainly, is starker Tobak. Since the most notorious pirates of the Baltic and North Sea come from the are of Northern Germany, I checked some facts by reading an essay of Matthias Puhle (Die Vitalienbrüder – Söldner, Seeräuber?, in: Ehbrecht (ed. ), Störtebeker – 600 Jahre nach seinem Tod, 2005). Before getting to the Seemannsgarn, I’d like to say that Mr Puhle sees no democracy in the pirate society, although some rules were markedly different than those of Northern European societies elsewhere during that time. We are in the late 14th century. 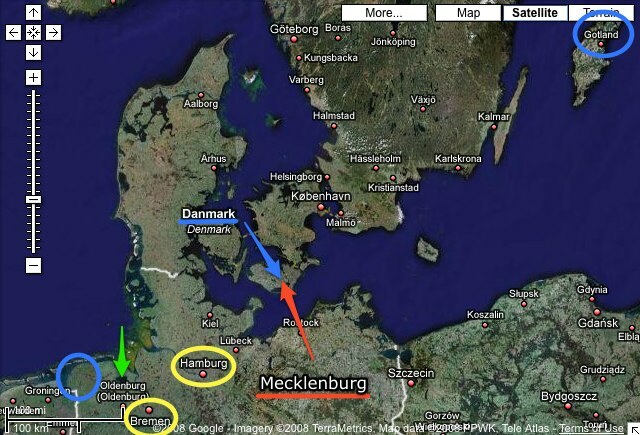 Mecklenburg and Denmark are at war over succession of the Danish king and hegemony in Sweden (see arrows on map below). Mecklenburg tries to distort Denmark’s trade. Some ships get a so-called Kaperbrief (letter of marque), acting on their own account: the Vitalienbrüder are born. Hanseatic cities open their harbours for the pirates so they can sell their loot. After hostilities are over, the pirates attack ships of the Hanseatic League, which sends an expedition to Gotland (blue circle on the upper right). The pirates lose the ensuing battle and retreat to East Frisia (blue circle lower left), where they are hunted down again. The story ends with the beheading of Klaus Störtebeker in 1401, who made deal with his killers according to legend: After he would be beheaded, he would walk along his lined up crew. Everybody passed would be spared. After walking past the 11th man, the judge stopped Störtebeker (it is not known how, either, by tackling him or throwing something in his way. All pirates are killed nonetheless. This is the beginning of the end: in 1433, the pirate haven of Emden is attacked and defeated by troops from Hamburg. So, what about pirate society? We do not know much, since sources are rare. This probably means that nothing truly revolutionary was going on. Otherwise some sources would have picked it up. The Hanseatic cities of Bremen and Hamburg were big trading ports during that time, and a lot of documents have been preserved. The Vitalienbrüder apparently had their roots in these cities, their saying was: “Gottes Freunde und aller Welt Feinde, außer derer von Hamburg und Bremen, denen sie keinen Schaden zufügen wollten, da sie dort kommen und gehen können, wann immer sie das wollten.” (Puhle) So the pirates were God’s friend and the whole world’s enemy, except for Hamburg and Bremen, which they wouldn’t hurt since they can move there freely. These corsairs were authorized by their governments to prey upon the shipping lanes of Christian countries. The Maltese Corsairs led the fight against the Turks, being led by the Knights of St. John. The Maltese Corsairs initially fought for religion, but after a while the rewards of piracy grew to greater appeal. Soon the Maltese Corsairs were full-fledged pirates, with no interest in religious ideals.